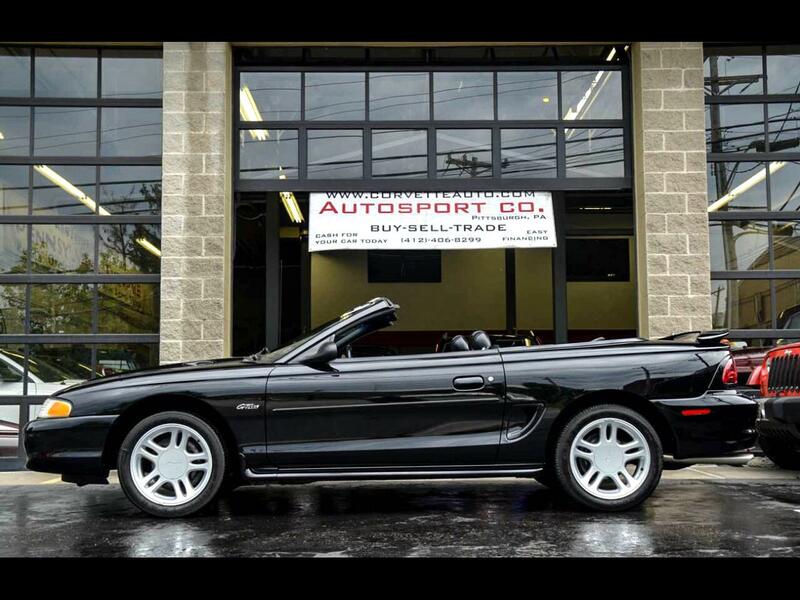 Used 1996 Ford Mustang GT convertible for Sale in Indiana PA 15701 AutoSport Co. Offered for sale is a Clean AutoCheck/2 Owner 1996 Ford Mustang GT Convertible , 4.6L V8/ 5-speed manual with only 49k miles and a brand new set of tires!! This 1996 Mustang GT Convertible is in excellent condition both inside and out and runs out flawlessly. The black exterior of this Mustang is in great condition with very minimal wear present; likewise, the wheels show excellent and have been fitted with a new set of tires. Throughout the smoke free, black leather interior there in no abnormal wear present and the dash area and carpeting all show excellent. In addition this 1996 Ford Mustang GT Convertible with only 49k miles is equipped with options such as: Clean AutoCheck, 5-Speed Manual, 4.6L V8 Engine, Power Convertible Top, Brand New Tires, AM/FM/CD and Tape Player, Air Conditioning, Leather Seats, Current PA Inspection, Original Books and much more!! For more information on this Triple Black, 1996 Ford Mustang GT Convertible with only 49k miles feel free to call/text Anthony at 724-388-4930. This car is currently on consignment and is not owned by the dealership therefore you must call before you plan on coming to check the car out so we can make arrangements for the car to be on site. Thank you for your interest, we look forward to speaking with you. Message: Thought you might be interested in this 1996 Ford Mustang.